Crenshaw, a “Harvey” for our time. Crenshaw, by Katherine Applegate, a Feiwel and Friends Book, imprint of Macmillan. New York, NY 2015. Crenshaw is a cat. A very large cat. If you’ve seen the movie, “Harvey,” with James Stewart, you might call Crenshaw a pooka, a shape changer from Celtic lore. Originally, Crenshaw was Jackson’s imaginary friend, when Jackson was seven. But Jackson is going into fifth grade and he hasn’t seen his imaginary friend since, well, since his family had to live in their van. But that was years ago. Now Jackson hears whispers that his family might not be able to stay in their apartment. They’re only whispers, because his parents never tell him anything important. All they say is that they are going to have a huge garage sale, hoping to make enough money to pay the rent. Jackson believes in science. He does not believe in imaginary friends. He thinks he has enough problems, trying to figure out his parents. “Sometimes I just wanted to be treated like a grown-up. I wanted to hear the truth, even if it wasn’t a happy truth. I understood things. I knew way more than they thought I did.” He’s afraid they will end up living in their van again. When Crenshaw shows up, it’s the last straw. “I invented you when I was seven…and I can un-invent you now.” Jackson doesn’t need one more problem. When he pleads with Crenshaw to leave, the oversized cat explains: “Imaginary friends don’t come of their own volition. We are invited. We stay as long as we’re needed.” Jackson insists he did not invite him. Crenshaw, the cat, is not thrilled to have to put up with the family dog, who senses the pooka, if he doesn’t actually see him. This is a wonderful book that hits all the right notes. 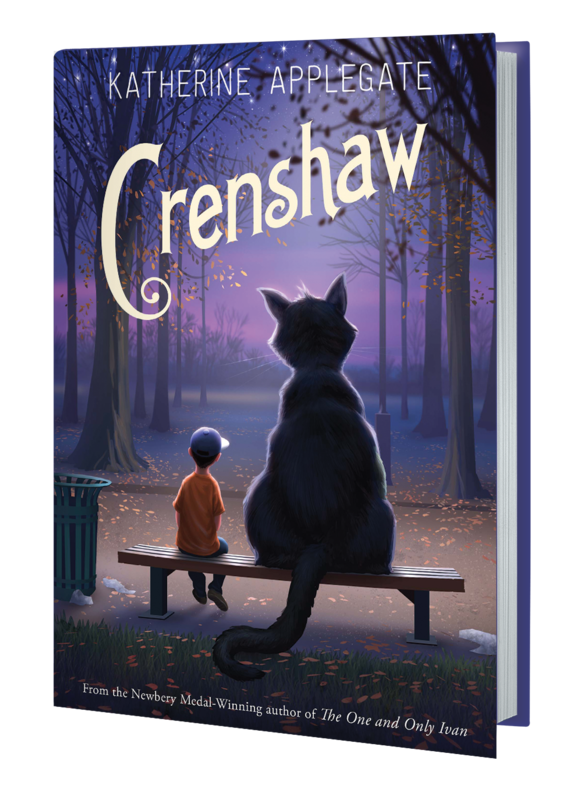 It’s never too dark for middle grade readers and Crenshaw is pure delight as an opinionated cat with attitude. And doesn’t that sound like most cats you know? The story of Jackson’s family is a reflection of the times in which we live. As a substitute teacher, I know of children who live in their family car. I know of teachers who keep a stash of granola bars in their desks for kids who’ve missed breakfast. I know that attendance at the free breakfast programs in our schools has increased. But the homeless families, for whatever reason, get way less press than the homeless men who linger on street corners and make everyone nervous. Yes, that is a situation we need to come to grips with, especially the homeless who are mentally ill. But let’s not forget about the families who’ve become homeless, like Jackson’s, through no fault of their own. A major medical crisis or a lost job can send a family, already living paycheck to paycheck, spinning into a downward financial crash. Like Jackson, we need to see the truth, even if it’s an unhappy truth, before we can solve the problems of homelessness and hunger. Let’s make sure these kids and their families can be seen, and like Crenshaw, remain seen until the problem is solved. There have been food drives, inspired by the book Crenshaw, at bookstores all over the country. If you’d like to find out how you can do more to help kids, click on the link below. 3 Responses to Crenshaw, a “Harvey” for our time. Stephanie, great book- really a favorite from this year’s releases. The Harvey link came to mind while I was reading, too. As you indicated, this story has depth and richness (an intentionally ironic word choice) that makes it stay with me and makes me want to read it again and again. Thanks for this post. I can’t say that rereading comes to mind with many titles, at least without a classroom to read it to these days. What a wonderful approach to a very serious problem. The library book club is currently reading EVICTED Poverty and Profit in the American City by Matthew Desmond. CRENSHAW will add another perspective to my understanding of the situation. Thanks for reviewing it! Hi Sharon–I got that book from the library but it is a hard read. Desmond was here in Madison but I missed him as it was the night of a Cubs game!